It’s hard to believe no one will be able to buy Perfect Plum from Stampin’ Up! anymore after the end of this month (if not sooner!). And I’d forgotten how lovely a colour it is. 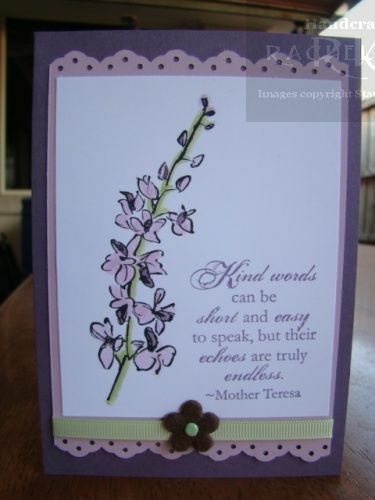 For this card I used Perfect Plum, Pale Plum and Certainly Celery (and some retired Certainly Celery DSP). Although we’ll have no more Perfect Plum come September, SNEEK PEEK we will have this gorgeous butterfly – a Big Shot Bigz Die – Beautiful Butterflies. I sponged the edge of the butterfly with Perfect Plum ink and edged it with Dazzling Diamonds. A few pearls finished it off. I think I love this pony as much as my daughter! 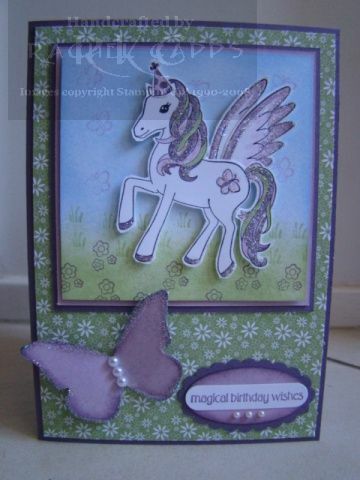 There are so many variations to make with her that I must keep making more cards to try more combinations! 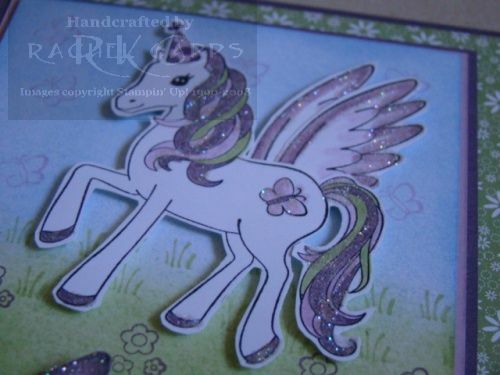 For this pony, I stamped in Basic Black ink and the used my blender pens to colour in the main and tail with Perfect Plum, Pale Plum and Certainly Celery inks. 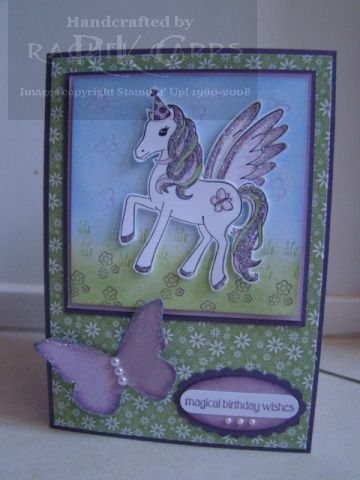 I then cut the pony out and stuck her on a sponged background (Bashful Blue and Certainly Celery) with dimensionals. The sentiment is also from Pony Party and I stamped it in Perfect Plum and punched it out using the Word Window punch. I punched out a piece of Pale Plum cardstock with the Large Oval punch and sponged the edges with Perfect Plum ink. Then I punched out a piece of Perfect Plum cardstock and layered them together. Three pearls finished off the sentiment. I really loved how this card turned out. 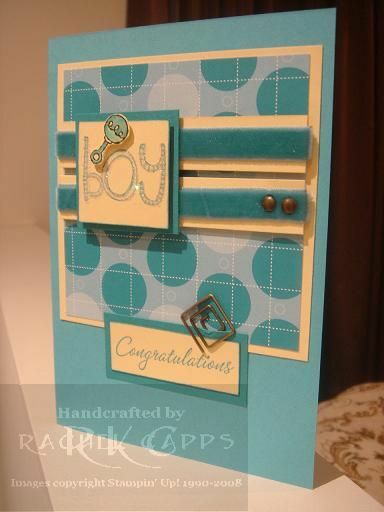 I based it off a card I’d made earlier here, but I really love this colour combination! If you love it too, please email me asap to order your Perfect Plum before it’s gone forever!! What do you think of my invitation I made for my New Catalogue Launch party? Do you like the butterfly or the flowers best? I love it all! 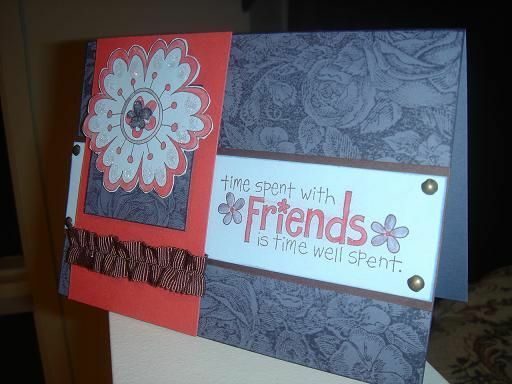 That’s because I love the stamp set ‘Time Well Spent’ used to make it. 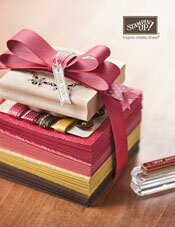 It is a Level 3 Hostess set in the new Catalogue, but it was our Christmas present from Shelli at Stampin’ Up! for all demonstrators last year. So generous of Shelli! This is a close-up of the butterfly coloured in with Tempting Turquoise and Dazzling Diamonds. My invitations are in snail mail today. Please do consider this your invitation to come along as well. You need to book in Monday 14th April 2008, 7.30pm onwards in your diaries at 7 Parklea Drive, Parklea, NSW, Australia. It will be a night of fun with door prizes, make and take projects, specials, champagne and nibbles. Bring a friend along and have a fun night out experiencing something different! Last night I did my first ever Cyberstamp with The INKlings group that I am a part of. There were 10 of us online last night, that was great! Our talented uplines set us 4 challenges to complete so the pressure was on the the creative juices forced to flow! To complete a gift tag of any kind in 10 minutes … phew! Apologies for the poor lighting for the photo. How simple was this card? 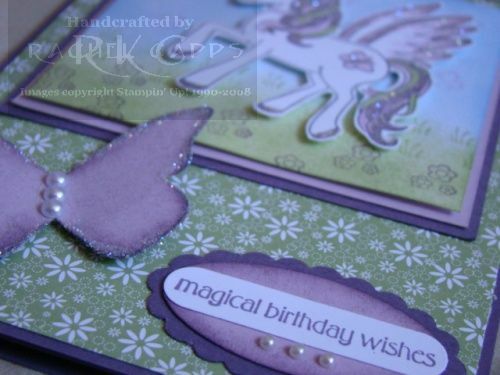 Just Whisper White and Lovely Lilac cardstock, Birthday Best stamp set and Basic Black ink with a colour in with the Lovely Lilac marker pen was almost all that was needed. 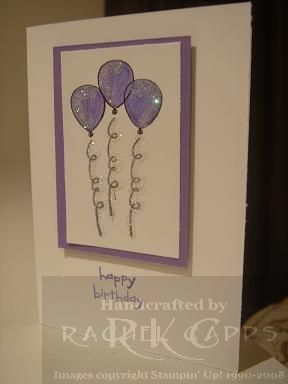 To finish the card off I used my trusty 2-way glue pen with Dazzling Diamonds glitter … bling! This was a sketch challenge. Of course, my first! What a great idea though … we all followed the sketch and were to use patterned paper on the card and choose our colour scheme from the patterned paper. 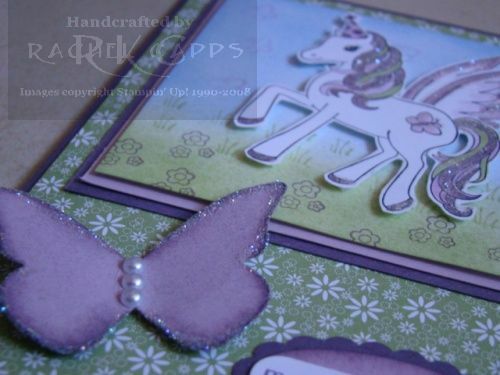 I used Loves Me DSP from the Summer Mini Catalogue … I’ve been meaning to do a baby card for so long! Now this was really a challenge … a colour challenge. 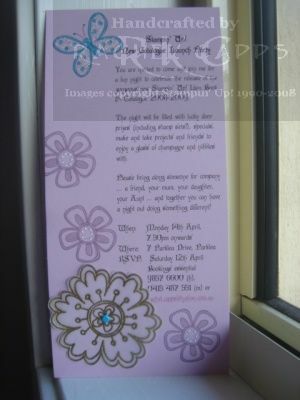 We had to create a card from the the colours: Vintage Violet, Ruby Red, Chocolate Chip and Cool Carribean. I didn’t have any Cool Carribean and substituted it with Bashful Blue. Would you have picked this colour scheme? Our last challenge was reverse masking … and now I have finished it!